Add dry pudding mix, dry milk powder, and water. Mix well using a wire whisk. Blend in 1/4 cup Cool Whip Lite. Spread mixture evenly into piecrust. In a small bowl, stir fruit spread with a spoon until soft. Add remaining 1/2 cup Cool Whip Lite. Mix gently to combine. Evenly spread topping mixture over filling mixture. Sprinkle peanuts evenly over top. Dissolve jello into boiling water. Pour in cold water, stir and set. ingriedients slightly and pour over other layers and let set. 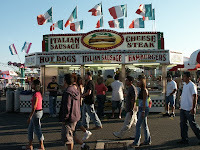 CARNIVAL OF THE RECIPES, NEW HAMPSHIRE Edition!! recipe.carnival@gmail.com by 12 p.m CST Saturday. We will try to provide some Christmas Diabetic Recipes for the Carnival next week. One simply can’t get started too early preparing for Christmas 2007.